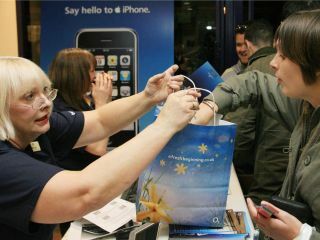 Apple iPhone sales have reportedly been 'brisk' so why have Apple and O2 been so coy about the number of UK sales? When Apple first announced the iPhone in January 2007 it was like a thunderbolt out of the blue. For here was a tiny computer maker with no experience in making cellphones, basically showing established players like Nokia how it should be done. No wonder so many phone makers responded with a shrug and wink. They didn't see Apple as a threat - it was lucky lightning struck once with the iPod. 18 months on though and the story is very different - the iPhone has come to dominate the mobile phone space in a way that its rivals are finding hard to ignore. Apple may not yet have hit its target of selling 10 million iPhone sales by the end of 2008, but in terms of mindshare, it’s almost the only game in town. 10 million phones. Sounds like a lot, but even Apple admits that is just one per cent of the global mobile phone market - giving it the tiniest toehold. And the truth is, Apple has so far sold a great deal less iPhones than that. How do we know? Well if Apple had already hit that target it would be crowing the numbers from the roof-tops by now. However it has only admitted to selling four million iPhones by January 2008 [WWDC 2008 update: that figure has now hit six million, according to Steve Jobs' keynote today], with the company’s partners in the USA, France, Germany and the UK saying sales so far have been ‘in line with expectations’. That suggests that they’re not selling well at all - until you remember that Apple’s partners are basing their numbers on the activations on their networks. O2 said in February that the iPhone was its biggest selling handset ever, but we only know about 200,000 activations so far - hardly earth-shattering numbers. Yet there’s plenty of anecdotal evidence to suggest that the iPhone is a total sell-out. Buyers have been snapping them up in AT&T, O2, Orange France and T-Mobile Germany stores then either hacking them to run off other networks or simply slipping them abroad. Why else would the iPhone be appearing on network stats in countries as diverse as Saudi Arabia, China and Brazil? They can’t all be the result of calls being made back home by American tourists. What’s done much to limit the iPhone’s appeal so far is the sky-high price of the handsets themselves, and the cost of an 18-month subscription deal - we're particularly sensitive to pricing of both here in the UK. Apple’s gameplan for iPhone 2.0 then already looks very different. We know that the company has already partnered with mobile networks to deliver the iPhone to over 70 different countries, and that Apple has regular punters - not just Mac and iPod zealots - in its sights this time around. So will Apple hit its target by the end of 2008? You bet and then some.